Are there conditions in the covenant of grace, "properly so called"? The recent faith and works dust up has been reminiscent of last year’s Trinity debate for the amount of heat generated. But slowly a little light may be beginning to dawn. Brad Mason agrees with Jones et al on the right/possession distinction, even though Mark Jones has written as though he doesn’t. Brad Mason accepts works are necessary for salvation. But he is still unhappy with Piper’s formulation. Why? Now, I am not interested in debating Piper’s broader covenant theology. As he is a Baptist I am bound to disagree with him somewhere along the line. But I am yet to see any statements from Piper that cannot be understood (easily) in an orthodox fashion. It is one thing to say that works are necessary to salvation because faith always includes fruits, God having ordained the one to always accompany the other; it is quite another thing to say that no one will be saved without good works. The distinction may seem minute, but it is quite grand indeed. There is necessity that is not conditionality, and there is conditionality that is not causal. The issue is that of conditionality. In what sense is it proper to speak of conditions with respect to the covenant of grace? Mason wants to say that works are necessary but not a condition, and that they are certainly not properly speaking a cause of salvation. This brings the debate quite closely into conversation with the 17th century debate among the Reformed orthodox: In what sense is it proper to speak of conditions with respect to the covenant of grace? I think interrogating the answers of Witsius, Turretin and Owen may shed some light. By way of summary, Owen says: it is possible to speak of conditions in the covenant of grace (though he would rather not), but it is not possible to speak of conditions of the covenant. What does this mean? First, Witsius: "With respect to us, the covenant of grace has no conditions properly so called." Witsius defines conditionality as having the "right" to a reward. But the new covenant is a primarily a testamentary covenant (like a will) – it therefore cannot be suspended upon a condition. There is "no condition of the whole covenant". However, the promises of the covenant are so arranged, that one must partake of the smaller things (ie evangelical obedience) before one partakes of the latter (glory). Turretin agrees with Witsius: the blessings of the covenant are "suspended upon no condition". Any duties required by the covenant are in fact blessings. You can see the similarity with Witsius (whose work was published before Turretin’s I believe). However Turretin does think we should speak of conditions in the covenant. For Turretin, something causal, and even something non-causal, like a duty, can be properly spoken of as a condition. So faith is the instrumental, grace-empowered means of the cause of acceptance of the covenant, by embracing Christ and his benefits, and so the cause of justification. Behind his view lies a view of the covenant of grace that sees it more as a mutual pact than a testamentary will. there is a different view of the covenant of grace. Is it a last supper/Hebrews style testamentary covenant, or is it a marriage/suzeriegnty-type treaty covenant? Both thinkers agree it is a mixture of both, but they place the emphasis differently. a) "something demanded as a pre-requisite to the granting of something else"
b) "in a legal instrument, a provision on which its legal force or effect is made to depend"
If Turretin was using definition b) he would agree with Witsius: there is no condition of the covenant of grace, because it does not depend on ("suspended upon") any conditions in us. And if Witsius was forced to use definition a) then he would agree with Turretin that there is conditionality in the covenant of grace, because faith and works are pre-requisites ("one must partake of smaller things") to greater blessings. This is not to deny that there are some differences between Turretin and Witisus. But it is obvious that much depends on one’s definition of condition. And so Witsius is careful in his denial: there are no conditions in the covenant of grace "properly so called". From memory, both Turretin and Witsius affirm that each others’ views are totally sound. This brings us to Owen, who writes after the continental divines. He declares the whole debate to be "mere strife about words". He concludes that there are "no conditions properly so called of the whole grace of the covenant" but if anyone speaks of duties as "the condition of the covenant, it is not to be contended about, though properly it is not so". Owen’s reluctance to speak of conditions is based on a testamentary understanding of the New Covenant and, I think, a brilliant reading of Hebrews’ use of the new covenant promise in Jer 31-32. He argues that the whole covenant is being set out in these chapters. "If it were otherwise, it could not be proved from thence that this covenant was more excellent than the former." If there are genuine conditions tucked away behind Jeremiah 31-32 then you could not show that the New Covenant offers the spiritual security that the Old Covenant lacked. Hence it is best not to speak of conditions of or in the covenant. It’s relatively easy, and possibly not very persuasive to whip out some Reformed orthodox distinctions. But I hope that thinking about the different ways conditional language might be used with respect to the covenant of grace is clarifying. With respect to Piper, I have certainly seen nothing to suggest that he thinks that the whole grace of the covenant is suspended upon either faith or works. If anyone is very keen I could try and write a follow up showing how some of this could be grounded in Galatians. Christian faith is the gift of the meeting in which men become free to hear the word of grace which God has spoken in Jesus Christ in such a way that, in spite of all that contradicts it, they may once for all, exclusively and entirely, hold to his promise and guidance. There’s a lot packed into this statement, but perhaps the most eye-catching part is the description of faith as the gift of a meeting. Barth says “In Christian faith we are concerned quite decisively with a meeting”. The Bible is clear that faith is a gift (Ephesians 2), but what is this idea of a meeting? Nor was it a good time when Christians grew eloquent over their action, over the uplift and emotion of the experience of this thing, which took place in man, and when they became speechless as to what we may believe. For Barth, this meeting is one in which God makes us free to trust in his gracious word. On our part we simply make use of the gift in which God has given me Himself. In a beautiful phrase, Barth describes faith as a kind of joyful breathing. I think the idea of being made free to trust describes well the biblical pictures – think of Blind Bartimeus being made able to see. ‘I believe’ means ‘I trust’. No more must I dream of trusting in myself, I no longer require to justify myself, to excuse myself, to attempt to save and preserve myself. Faith delivers us from trust in such gods, and therefore also from the fear of them, from the disillusionments which they inevitably prepare for us again and again. We are given freedom to trust in Him who deserves our trust: freedom by holding on to Him who in distinction from all other authorities is and will remain faithful. We ourselves will never be true to ourselves. Our human path is, as such, a path from one disloyalty to another; and it is the same with the ways of the gods of this world. They do not keep what they promise. So with them there is never any real peace and clarity. In God alone there is faithfulness, and faith is the trust that we may hold on to Him, to his promise and to his guidance. I found this to be a powerful and persuasive chapter. I particularly liked Barth’s language about God giving us the freedom to trust him and I think there’s a lot to learn from it. Next time we’ll look at Barth’s discussion of faith as knowledge. If you’re anything like me, Karl Barth is the kind of theologian who you’ve heard lots about, but haven’t actually read. Often called the greatest theologian of the 20th Century, he sounds like he’s an interesting and provocative read. But his main work, Church Dogmatics, is a massive multivolume tome. Not only is it expensive (at least for an edition where the non-English phrases are translated), but you also risk missing the forest for the trees. the hour seven a.m., always after we had sung a psalm or hymn to cheer us up. 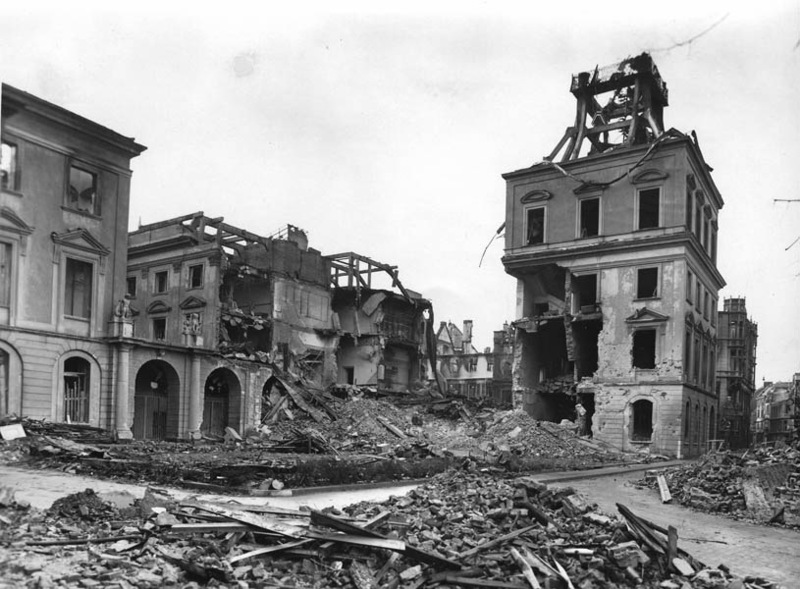 About eight o’clock the rebuilding in the quadrangle began to advertise itself in the rattle of an engine for breaking up the ruins. So, for that reason, and because his ideas are rooted in an exposition of a classic text, the Apostles’ Creed, I thought this would be a sensible place to start reading Barth. Each of the chapters in the book begins with a proposition expressed in a sentence or two which Barth then unpacks. My plan is to blog about each of these chapters, giving Barth’s proposition and then highlighting and discussing what seem to be the main features. The first chapter is called the Task, and it’s Barth’s view of what he himself is doing in Dogmatics in Outline, so I’ll end this introductory post with an overview of this chapter. So Barth is not invoking the scientific method in a strict sense, but he is wanting to allude to both the rigour and provisional nature of human scientific investigation. He doesn’t see Christian dogmatics as something fallen from Heaven in a pristine state, but as the ongoing task of critically examining what the Church proclaims. In other words, he says the task of the science of dogmatics is to answer the question: “what as Christians do we really have to say?” I appreciated this emphasis on refining the Church’s proclamation – it means that the goal of dogmatics is inherently practical, missional and churchly. It ought to help keep us from descending into “meaningless talk”. 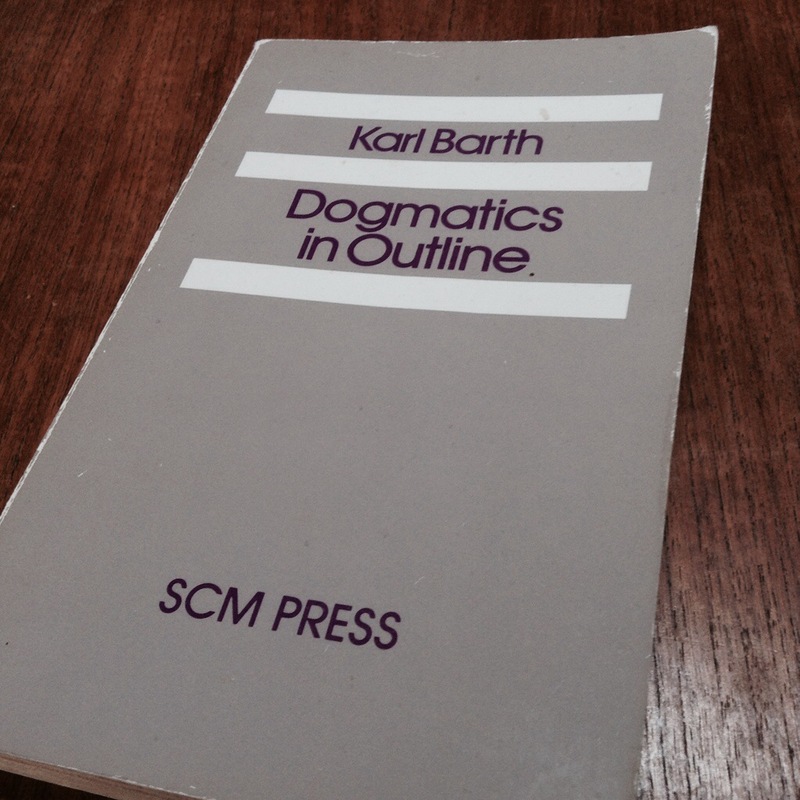 A related point that Barth stresses is that dogmatics is meant to be done by the Church. This might seem like an obvious point, but it serves to nicely begin to locate Barth for us. His background and early career was in the liberal university theology of early 20th Century German. Barth came to a place where he rejected that theology as empty and rethought nearly everything. Clearly in this opening chapter we can see how Scripture, proclamation and the Church are vital for him, but the fact that he has to stress these points shows just how different his context is to many of ours today: he is an ex-liberal (and who knows still how liberal) talking I imagine to liberals and ex-liberals. In his preface, Barth describes how he discovered in the rubbish of the University a bust of the ‘Father of liberal theology’ Friedrich Schleiermacher, which was “restored to honour again”. So when we read Barth we need to be aware that he may not be reacting to our debates, and that he has been coming from quite a different place. We had a training session a couple of weeks ago where we were asked to think about what the most important roles Jesus has in God’s plan. I want to stress at this point that this arrangement is by no means “Doctrine” – it’s not the teaching of the church! There may well be some horrible errors that may come out of this arrangement of the topics. 2. This arrangement emphasises links with the doctrines of Creation and New Creation (in Heading A) and Salvation (in Heading B), and the links between those doctrines. 3. Applications to the doctrines of humanity and Christian life are more obvious – we are the image of God, washed by Christ’s blood. Of the two headings above, it is Christ as the Image of God that will be more controversial, since the second heading corresponds pretty well with the traditional heading of Priest in the Prophet/Priest/King triad. Let me expand what is under each heading. In these last days he has spoken to us by his Son, whom he appointed the heir of all things … He is the radiance of the glory of God and the exact imprint of his nature (Heb 1). In these last days he has spoken to us by his Son … He is the radiance of the glory of God and the exact imprint of his nature (Heb 1). Christ being a better Adam – a perfect humanity – implies the next two points. “Let us make man in our image, after our likeness. And let them have dominion over the fish of the sea and over the birds of the heavens and over the livestock and over all the earth and over every creeping thing that creeps on the earth.” (Gen 1). All these points combine to produce our final point, that Christ as the image of God is worthy of all praise and honour. More briefly, our second heading – Christ as the Mediator of a New Covenant. While there are links between the headings, I’m not sure that this aspect of Christ’s work can be described as an aspect of Christ as the image of God. In both these passages, Christ’s pre-eminance and God-likeness are discussed in terms of his image, before discussing his mediatorial work as he reconciles us to God through the cross. This also seems to be the broad pattern in Hebrews, with chapters 1-2 establishing Christ as the supreme image of God, and the rest of the book examining the signficance of Christ’s redeeming work. So this arrangement of ideas appears to be Biblical. Before I get too excited, what are the problems with it? To my mind the distinction between image and Son is pretty blurred, and there may be good reasons for preferring sonship as a heading. I haven’t got an obvious place to put the theme of Christ as defeater of Satan (aka Christus Victor). Before you respond, why not read over some of those verses again, and offer praise to the God and Father of our Lord Jesus Christ! Dave Bish has been considering the issue of women teaching in student Christian Unions. He says that where CUs are divided on this issue, the majority should lovingly submit to the minority. For example, in a CU where the majority hold to the complementarian position (they believe that women are equal in status but not in role, and believe it is exclusively a man’s role to lead through teaching), they should allow women to teach so that the minority don’t feel oppressed. Or vice versa, in a majority egalitarian CU, the majority should not impose women teachers on the complementarian minority. Dave distinguishes between the position in a CU, which is an evangelistic organisation with a small shared doctrinal basis, and a church, where decisions have to be made about how to teach about marriage and whether to appoint female elders. I want to make a couple of points in response. Firstly, a lot of what Dave is saying seems to be an application of Romans 14, correct? An egalitarian CU ought to welcome a complementarian person (whom they would judge weak in faith), by not putting the hinderance of a female speaker in front of the complementarian. That’s fine, but when we looked at Romans 14 in our small groups earlier this year, we noted that Paul specifically talks to those who are ‘strong’ in faith – those who are happy to eat anything or drink anything. He tells those people not to destroy the work of God by what they eat or drink. So in essence, the strong should love the weak by being willing to give up their bacon sandwiches or their beer so that the weak people don’t feel that they are in sin or unwelcome. What he doesn’t say is that the weak people should act like the strong to welcome the strong. So if the house church contained a majority of people who felt eating pork was not right, Paul’s not saying they should start serving bacon sandwiches before church just so the people who feel that eating them is ok feel welcome. So basically, as well as being loving, Christian communities should default to the “least sin” position. It is the strong who have an obligation to the weak. I’d argue that in the complementarian/egalitarian debate in CUs, it is the complementarians who are more obviously weak. That’s because everyone agrees that male speakers are ok, it’s just whether female speakers are ok or not. When a male speaker speaks, both complementarians and egalitarians are happy. No one is sinning. The egalitarians might be thinking it would be great to get that really excellent female speaker in sometime, but like missing out on bacon sandwiches, they’ll just have to put up with it for the sake of their weaker brothers and sisters. However when a female speaker speaks, often complementarians are sinning. If they really are convinced it is wrong to sit under a woman’s teaching then they are sinning, and we’ve just mucked up our application of Romans 14. An egalitarian CU leader might feel that he’s sinning by not allowing women to have their God-given right to teach, but I think we can agree that this is a less obvious sin than the complementarian’s. Ok, that was point 1. Point 2 is much more brief. Which is to consider how CUs and churches are different in this respect. I think they are, but possibly not for quite the same reason as Dave. The “minimal doctrinal basis so we can have a shared mission” point is fair enough, but it’s quite a pragmatic argument that is prone to a ‘where do you draw the line?’ response. I think the reason churches can be a bit more inflexible on this is that they have elders who have authority and responsibility for those decisions. If I’m not sure whether someone should or shouldn’t teach in my local church, I am happy to sit under that teaching regardless, because I defer to the authority of my elders, knowing their God given role is to make those kinds of decisions and to bear the responsibility for them. In a CU it’s not quite the same, because I’m not convinced that a CU leader has quite the same authority to make those kinds of decisions. Additionally, I would think that a convinced egalitarian church leadership would probably be sinning if they didn’t appoint a woman they considered suitable to the eldership since the nature of church leadership is quite different to an occasional CU speaking engagement. So in a church the egalitarian/complementarian positions become a bit harder to classify into weak/strong. It’s complicated stuff, and I haven’t had a coffee yet, so please don’t take this as anything other than tentative. If you think what I’ve said is wrong, or has dangerous implications let me know. With that, I’m off for a bacon sarnie!